In the past few years drugs companies, TV shows and book publishers have all made moves into a rapidly emerging area of the British dog ownership market. All are keen to tap into a growing trend which has been expanding every year for the past decade. And expanding really is the best placed adjective to describe what’s happening. Britain’s dogs are getting fat, they’re dying and the cause is, quite simply, their owners. Picture in your mind, if you can stomach the thought, an image of an abused dog. A timid, cowering bundle of bones, wide eyed and frightened of its own shadow? Understandable. It’s the stereotypical image of an abused pet. We’d probably be able to reach a similar consensus when conjuring up a mental picture of a ‘typical’ animal abuser. It’s a fair bet that not many people, when asked to imagine an abused dog and the perpetrator behind the cruelty would visualise a fat Labrador and a little old lady, responsible for the dog’s condition. Tragically though, the obese Labrador is probably going to suffer just as many, if not more health problems than the skinny, under fed dog and it’s just as likely that his misguided owner is sending the poor animal to an early grave. Let’s be clear. There is no such thing as killing with kindness when it comes to the animals we chose to share our lives with, killing is killing. Abuse is abuse and animal cruelty comes in many forms regardless of its intent. Britain is suffering from a growing number of obese pets. As our domesticated animals share the lives and lifestyles of their owners, as society gets fatter so do our pets. As a society it’s time to give a name to the fat dog epidemic sweeping the country in order that the people responsible are completely aware of what they are doing. It’s animal cruelty. Plain and simple. Abuse by any other name is still abuse and whilst over-feeding our pets to the point of obesity may be a very modern form of animal cruelty, it is cruelty nevertheless and must be described as such. Dogs rely 100% on their owners for the diet they eat and lifestyles they lead. Unlike children of a certain age, dogs – with the odd exception – can not open cupboards, can not be duplicitous and conniving spending their dinner money on junk food instead of the healthy option they swore they were eating at school. Dogs are unable to read labels and they surely can not be expected to self regulate their calorie intake when their very instinct is that of the scavenger, eating as if unsure where their next meal will be coming from. It is this very instinct in fact which leads many owners to constantly give into the longing eyes, the charge to the biscuit tin and the general pressure our clever pets are able to exert over us with that ‘never been fed before’ facial expression that have mastered so well. Are they hungry? No, very unlikely. They are simply doing what dogs do, using their canine skills to convince their sole providers of their desire to eat. Fat people, by and large, get fat by eating more than they need to and simply not burning off the calories they take in with an appropriate level of exercise. Dogs are no different except, maybe in one area. Most dogs WANT to burn the calories off but often they are not given the opportunity to do so. A fat dog is a less healthy, less happy dog. A seriously fat dog will undoubtedly die as a result of their weight. Owners need to take responsibility for the health of their pets, regardless of how they lead their own lives. Gone are the days when we should laugh or attempt to find some twisted humour when looking at newspaper images of the ‘super’ fat pets we often see. Would we laugh if the images we were seeing were that of a seriously underweight dog, suffering from malnourishment? 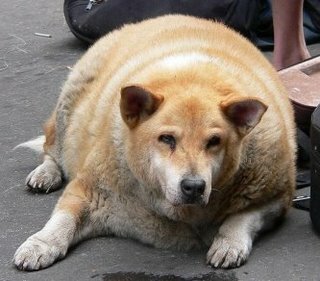 Doubtful, yet the obese dog is likely to die a slower, more painful death. That’s the harsh reality and that’s why we can no longer see past this issue as anything other than neglect of responsibility on behalf of pet owners. Understanding a dog’s basic nutritional requirements does not take a great deal of research or time. Failure to comprehend what a dog needs in order to maintain a healthy lifestyle is, plainly, unforgivable living in the information age as we do. Britain is in need of a culture change. Fat pets should not be a source of amusement. Unless someone helps them, they will die. They will suffer and die. Their neglectful owners will have killed them. That is not a form of kindness no matter how you look at it. Speak with your vet and get an understanding of what your dog’s ideal body weight should be. Get a solid understanding of what nutrients and daily calories your dog needs to reach and maintain his/her ideal weight. If you are going to feed snacks in between meals, reduce their main meal(s) accordingly. Don’t feed snacks AS WELL as their normal meals. Give your dog the chance to exercise properly. That means running, allowing their heart rate to increase. Do this gradually. If you must feed your dog whilst you snack, do not give them tidbits of the snacks you eat. Your dog will be happy to eat a small handful of their normal food and will not then suffer by consuming the calories of the sugary or starchy food you might snack on. Remember, dogs are scavengers by nature and will do what it takes to make you feed them, they are NOT actually hungry. Finally, if you are still not motivated enough to make the changes necessary to help your dog become fit and healthy, picture yourself in the vet’s waiting room as you sit with your beloved best friend sharing the last few moment of their life before the vet is called upon to end their suffering. How will you feel knowing that it is YOU who has denied your precious companion many months and possibly years of their life? You won’t sleep and it will haunt you forever. Making a change is easier than living with the grief and guilt of denying your dog the life they deserve.